Most Links below go offsite..
On their Galpinized website, you'll find a Barris custom made for them. It graced their 2004 calendar. There's also a mint green(meadow mist) and a dusk rose to be found in the gallery. Valmet Custom Retractable Hardtop Concept - no longer appears on their website. Idea was later used on the MarkX Lincoln Concept. Editorial: Customizing your car is a personal preference. Do realize that if you ever plan to resell, you may be limiting your market for the car. Custom parts that can be removed and replaced with original parts without extensive body work are the route to take if you don't plan to keep the car "forever". Do try to store any original "OEM" parts in good shape, that you take off, ... or offer them for resale. 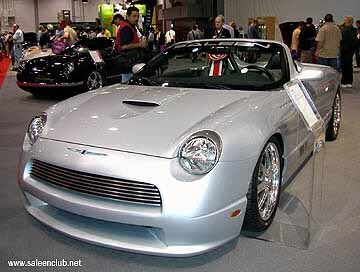 Update: May 16, 2006 - The Saleen Bonspeed custom was auctioned at Barrett-Jackson in Scottsdale this past January. sold for $70,200. Update: November 9 2004 - BonSpeed is planning to offer their special body parts from this bird this winter, 2005. Saleen is no longer in the picture - nothing from them. Update: April 19, 2004 - Acccording to "Gary" on my guestbook, Saleen will be selling performance parts for the 02-05 Thunderbirds on their website in the near future. This may be the avenue that people have been looking for. There will be no Saleen T-bird as Saleen did not get enough interest from Ford or Ford dealers about a Saleen version of the Thunderbird. 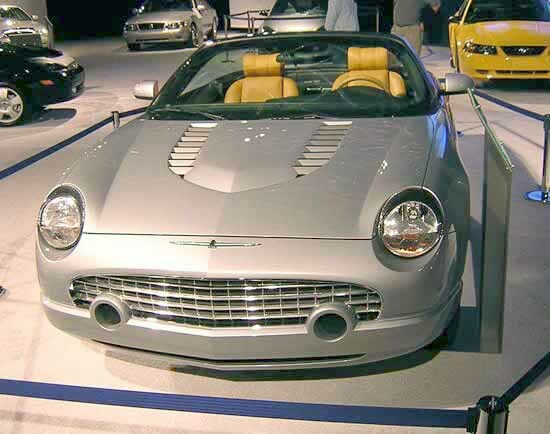 Update: Feb 17, 2004 - Apparently Saleen will NOT be marketing this model. 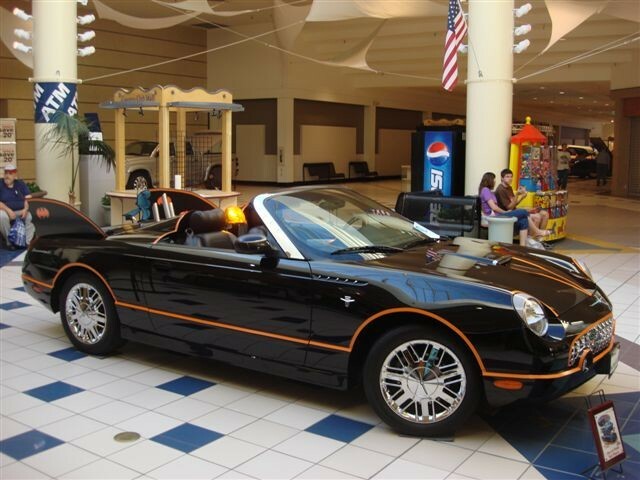 this according to dealership in Atlanta that had one on order. Update: Feb 5, 2004 - Haven't heard a word about anyone getting one. 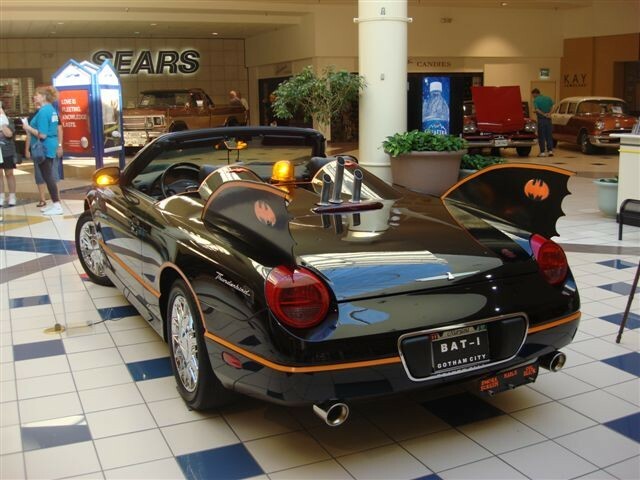 A dealership in Atlanta is still waiting for theirs to come in. Update: July 2, 2003 From Saleen - Orders were delayed and now Saleen will be using 2004 models - new colors. First shipments are expected to some authorized Ford Dealers in August, 2003. Read the TBN for the latest order information. Ford has shelved** their own version of a supercharged model so this may be the next best thing. **shelved? what does this mean? Set aside for another time? hearing a rumor lately that Ford's version is not totally shelved - will it really come out in 05? Update: March 13, 2003 - Finally - a little bit of info showing on BonSpeed's site (page gone)! UPDATE: FEB. 11, 2003 - Authorized dealers are receiving ordering information right now. 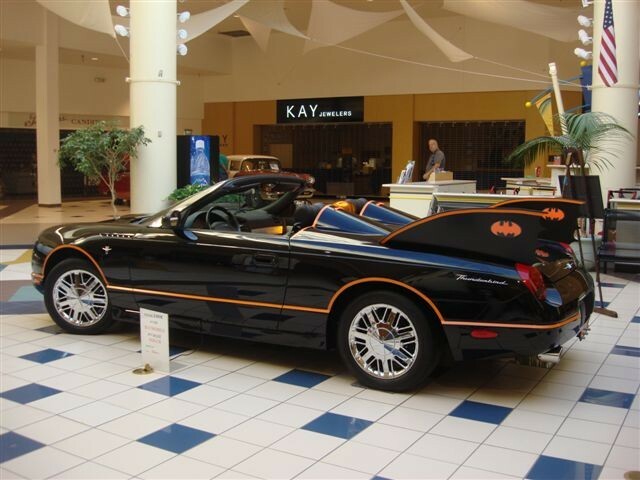 I do not have a list of authorized dealers for the Saleen Thunderbird. You might want to contact Saleen's website - they only show Mustang and S7 authorizzed dealers but that should get you started on your search for a dealer. What was going to be available on this bird? Click here for a list of features and options. This car is available to order or purchase at authorized Saleen Ford dealers. Interesting to note: I searched google for info on the Saleen. The best are above. A press release for November 5, 02 was posted on a Saleen Club enthusiasts site (formerly http://www.saleenclub.net/) but their site no long shows the Saleen Thunderbird press release - only older releases? wonder why?? All that I was able to find was the press release that Google had cached which I've quoted below. There is no mention of the Thunderbird on Saleen's site. Not sure who originated the press release. IRVINE, Calif., Nov. 5 -- Steve Saleen announced today that the Saleen Thunderbird-Bonspeed Edition concept car that makes its world debut on the Ford display at the 2002 SEMA Show will be going into limited production. “Initially,” Saleen president, Steve Saleen says, “our plan was to build the T-Bird to showcase the growth and diversity of Saleen, Inc., and to celebrate the hot rod spirit of the SEMA show. But as we started thinking about the flavor and character of the Thunderbird,” Saleen continued, “we decided to join forces with a company that is immersed in the hot rod industry. And we picked Bonspeed, a manufacturer of automotive aftermarket products and a design and engineering firm specializing in wheels, gauges and accessory products. Starting under the hood, the Saleen T-Bird’s 3.9-liter V8 has undergone a now typical and well-proven Saleen route to increased power and torque. A Saleen Series IV twin-screw supercharger is added, fed by a specially designed Saleen 80-mm cast aluminum inlet tube, a Saleen cast aluminum intake manifold, and a water-to-air intercooler. Sequential electronic fuel injectors flowing 30 lb/hr and a Saleen PowerFlash™ performance calibration computer handle engine management. Exhaust gases in the concept car are routed through a Borla stainless steel exhaust system. Initial dyno runs indicate an output of around 365 bhp and 390 lb-ft of torque for the 3.9-liter V8. The engine is mated to a 5-speed automatic, but the production version will also offer an optional Saleen 6-speed manual gearbox. The concept T-Bird has an Air Ride Technology suspension all around, but production versions will feature Saleen Racecraft suspension at every corner, including racing-developed shocks and springs and a rear end assembly featuring the Saleen MaxGrip speed-sensitive limited-slip differential. A Saleen braking system, including slotted 2-piece, 14-inch Brembo front brake rotors and calipers, handles stopping power on the show car. The Saleen-Bonspeed T-Bird rides on Bonspeed forged alloy wheels, 18 x 8 inches up front and 19 x 10 inches at the rear, fitted with Pirelli’s legendary ultra-high-performance P Zero radials: 245/40ZR18 and 285/35ZR19, front and rear, respectively. 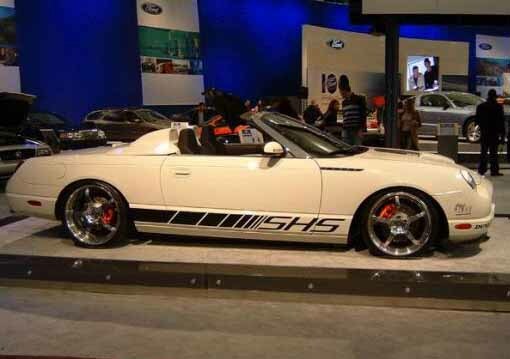 Saleen and Bonspeed designers jointly created the concept T-Bird’s hot rod-inspired exterior styling. The nose has been extended three inches and reshaped, and the stock Thunderbird’s egg crate grille has been replaced by a sporty billet aluminum grille fabricated by Lil’ John Buttera, a hot rodding icon. 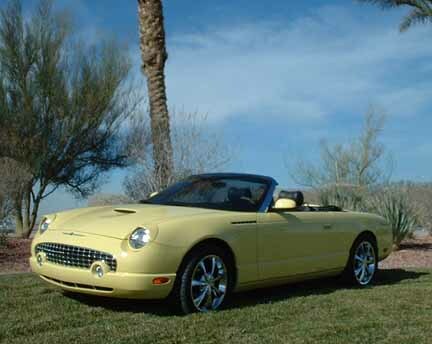 Every T-Bird is a convertible, but the Saleen-Bonspeed concept ’Bird is more than that: It’s a Speedster. A special rear deck has been crafted, incorporating a hard-shell Speedster cover that features a split-wing rear spoiler, evoking the flavor of hot rods and prototype sports racing cars of the ’60s. At its forward edge, the Speedster cover mates with twin rollover hoops positioned behind each seat. Along the sides, the lower rocker panels have been extended and reshaped, while at the rear, the bumper has been re-contoured with an aerodynamic rear diffuser panel integrated into the underbody. Exhaust pipes are conspicuous by their absence: They are hidden in the diffuser panel. The stunning silver paint that covers the Thunderbird’s contours is a special Saleen color provided by BASF. This paint has also been applied to the sheet metal surrounding the sharply raked windshield and to the front fender vents. “We wanted to create a hot rod flavor for the car, inside and out,” says Brad Fanshaw, president of Bonspeed. That flavor starts with an interior swathed in luscious leather. Pearlescent black and charcoal gray tones predominate with accent areas covered in pearl black and brushed metal-tone leather. Door panels have been re-covered in these accent tones with metal door surfaces featuring metal-tone leather. The body-hugging seats incorporate head rests re-sculptured to mimic the design of the dual roll bars. And if you look closely, you’ll note that the stitching used on the seats is a unique design and is a slightly lighter gray tone. Other interior modifications include the armrest portion of the center console, which has been reshaped to make it sleeker and lower. Also, the console has been wrapped in leather as have the lower dash and the panels behind the seats. Luxurious, deep-pile, black carpeting offers a dramatic contrast and highlight to the rich leather used throughout the Saleen Thunderbird–Bonspeed Edition. We’d bet there weren’t many hot rods running around with eye-popping three-tone leather interiors like the one on this Saleen–Bonspeed Thunderbird, but you must admit, it fits this car to a "T". 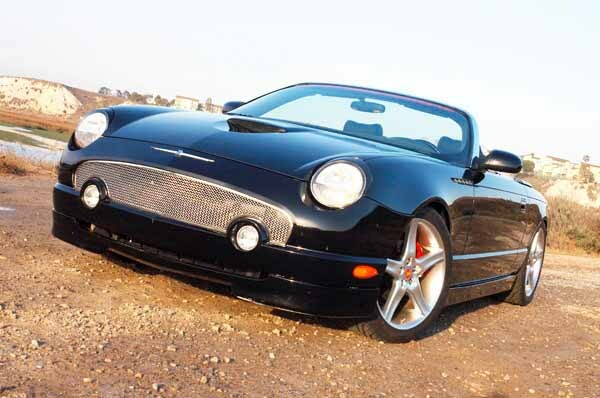 Saleen will take orders on the production version of the Saleen Thunderbird– Bonspeed Edition starting in November 2002 with first deliveries scheduled for spring of 2003. During the past 20 years, Saleen, Inc. has repeatedly demonstrated its ability to design, engineer, manufacturer and market high-performance specialty vehicles working closely with Tier 1 suppliers around the world. “Our expertise has been primarily focused on high performance,” Steve Saleen explained, “but it’s been diverse as far as the types of vehicles we have produced -- everything from Mustangs to Explorers to our S7 supercar.” And the Saleen Thunderbird-Bonspeed Edition is just another example of our expanding product capabilities. “Saleen has experienced rapid growth recently,” he continued. “Last year we introduced the S281E, the Extreme, the fastest, most powerful production Mustang on the planet. And this year Saleen engineers have found ways to increase the output of its supercharged 4.6-liter engine to 445 horsepower and 450 lb-ft of torque. “We also have a much improved base supercharged Saleen model for 2003, featuring a new Lysholm twin-screw supercharged engine pumping out 375 horsepower and 415 lb-ft of torque. “In addition,” Saleen explained, “starting in June we began our first deliveries of the production version of the exotic, mid-engine Saleen S7 supercar. Since the company’s inception in 1984, Saleen has produced over 8,000 vehicles, more than any other specialty manufacturer. An eight-time Manufacturers’ Champion in GT sports car racing, Saleen’s facilities include research, design, engineering and manufacturing capabilities. The company's line of products and services also includes the Saleen S281 and S281-E, the exotic, mid-engine Saleen S7 supercar, Saleen Competition, Saleen Performance Parts, and Saleen Engineering and Certification.